Having a great mixing template is key to working fast and focused. A well thought out template system allows you to mix more music and get straight to the point without wasting time on routing and plug-ins. We’ve asked our pureMix mentors to share their templates in Pro Tools, Cubase, Logic, Ableton and Studio One using stock plug-ins. Open it, use it as it is, or be creative and use them as a foundation to build your own custom template. Base your template system after some of the biggest names in the industry, it’s what we do, it’s what the Pro’s do, only at pureMix.net. Power, efficiency & creativity are now one click away. 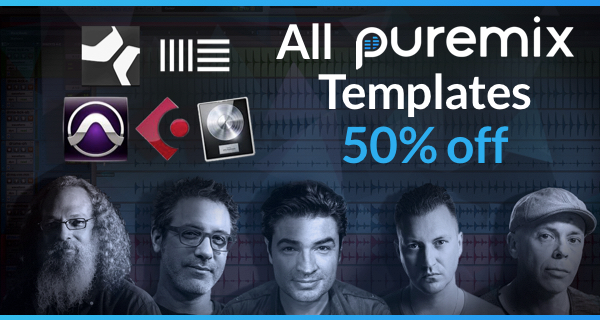 Get Your Mixing Template – 50% Off! They all have different purpose and different sounds so make sure to read their descriptions first at the store pages formt he link above. - Luca Pretolesi’s on EDM workflows. This entry was posted in DontCrack, Event, Promotions, Video and tagged Andrew Scheps, Fab Dupont, Fred, Luca Pretolesi, Puremix, Ryan Hewitt, Template, tutorials. Bookmark the permalink.